7/29 Cup of Coffee: Pawtucket picked up a pair of wins, led by Marcus Walden (pictured) and Shawn Haviland, who allowed just one run combined. Jay Groome had an up-and-down outing while Bobby Dalbec hit his sixth home run of the year. 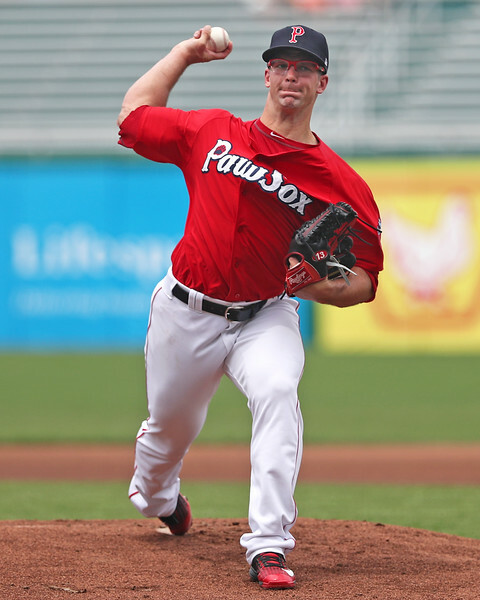 Marcus Walden was tough to solve in this one, tossing a seven-inning complete game shutout. He allowed just five hits, one walk, and struck out six to lower his ERA to 3.36. Heiker Meneses and Bryce Brentz led the way on offense, as they both went 2 for 3 with a pair of runs driven in. Sam Travis was 1 for 2 with a walk and a single. Pawtucket received more stellar pitching in game two. Shawn Haviland started and went the first six, allowing just one run on seven hits and one walk while striking out seven. Chandler Shepherd picked up the save with a scoreless ninth with two strikeouts. Brian Bogusevic had a big night, going 2 for 3 with a double and a home run. Sam Travis singled in the go-ahead run in the fifth. Rusney Castillo, Tzu-Wei Lin, and Ryan Court also roped doubles. The Sea Dogs were rained out for the 14th time this season and will make it up as part of a doubleheader beginning today at 5:00 p.m.
Jay Groome had a rough third inning on his way to taking the loss. He allowed four in the frame, and five runs overall in five innings of work. On the positive side, Groome matched his season-high in innings and punched out six. Robby Sexton was very good in relief, allowing just one run in four innings on four strikeouts and no walks. Bobby Dalbec provided the only run for Greenville with a solo blast. Lowell walked off in 10 innings on an RBI single by Michael Osinski, who had two hits. Garrett Benge and Yoan Aybar each went 2 for 4, with Aybar picking up his fourth triple. Kevin McAvoy started and allowed just one hit and no runs in five innings. He walked two and struck out four. Dakota Smith blew the save by allowing two runs in the seventh, but Ryan Oduber picked up the win with a scoreless 10th. The GCL Sox broke out offensively, with Pedro Castellanos leading the way with a 3-for-4 performance with two doubles and two RBI. Kervin Suarez and Jagger Rusconi also had two hits and two RBI. Edilson Batista started and allowed three runs in three innings. Alejandro Rodriguez then allowed four runs in four innings but struck out six and did not walk a batter. Marcos Lantigua and Tanner Raiburn each tossed a scoreless frame. Andres Jimenez took the loss, going the first five innings and allowing three runs. He did strike out six and walk none. Yasel Santana pitched two scoreless innings as well. Marcos Martinez went 1 for 4 with three RBI and Ivan Houellemont added a double. Player of the Night: After allowing six runs in his last start, Marcus Walden tossed seven scoreless innings on the way to his ninth win of the year. Walden has been mixing up his appearances between starts and relief appearances, but has been solid throughout the year. Overall he has a 3.36 ERA, 72 strikeouts, and 28 walks in 88 1/3 innings.